“Una and Miguel are total opposites! He’s the village heartthrob, part of the good-looking ‘in’ crowd while Una is popular for the wrong reasons. She writes songs, plays the harmonica, wears a hemp anklet, and has equally eccentric friends–not at all the type of girl Miguel and his friends go for. They call her and her friends outcasts. I have a few questions of my own to add: Why was this book reprinted? Was there a serious need for a young adult romance novella back in 2012? And why did Adarna House think to reprint this particular title? Because, honestly speaking, Una & Miguel is not a very likeable book. My main problem with the book, I think, lies with the fact that it isn’t timeless. The story of Una & Miguel feels very dated, even though the author updated the story with so many 2011/2012 pop culture references. And for a book with a universal theme of love and acceptance, feeling dated is quite the feat–and not in a good way. Then there’s our main couple: we never get to know Una & Miguel enough to actually root for them. And during the time where we’re supposed to empathize with them, we don’t. I, personally, found it very hard to root for either one of the protagonists because they were so damn unlikeable. Both are hypocrites, wanting the best of both worlds–standing out and still being accepted. Still being popular. And that sealed the book’s fate with me. I didn’t care for the characters, so I didn’t care how their story unfolded. And, if you read the book, it feels like the author doesn’t care all that much either. Because as soon as Una and Miguel admit their feelings for each other, the story ends. We already know that story. So many books have written that story. What we want to know is what happens next, and what happens despite. Eleanor & Park told us why the boy straddling the line between being ‘in’ and being an outcast cannot be with the girl from the wrong side of the tracks. And yet it gave us a story worth falling for. Worth crying about. Alex Sanchez’s Getting It had a third non-love interest character play up the conflict about a guy trying to get the girl of his dreams. Heck, Tall Story was able to tell the same story better, and it was a story about siblings, and not a love story ripe with conflict. So, once again, I ask: why reprint Una & Miguel? I’m not trying to be a book snob. I love that local publishers are actually publishing books again. But why not push the boundaries? Go ahead, sell romance. But give us something new. Something we can proud of. Something that will say, hey, Filipinos can write fiction that’s just as good as the international titles–if not better. So let’s quit with the Una & Miguels, the She’s Dating the Gangsters, and the Every Girl’s Guides. Let’s have more of the Roles, and Vince’s Life, and After Edens. Please. I didn’t really know what to expect when I picked up A Monster Calls. A few friends recommended it to me, and I was a little ambivalent when I read the synopsis. It didn’t speak to me. But when I stumbled across the edition I found, this beautifully illustrated version by Walker Books, I knew I was buying the book. If only for the really beautiful illustrations. But when I read the book, I fell in love with it. Conor, the main character, is flawed. And that makes him, for me, a great character. He is a great character study on human beings. This is a child fashioned by the everyday life, shaped by external forces beyond his control, and choices that were his to make. Choices that, we find out as the story goes along, are colored by what he was taught–by the beliefs instilled in him. Choices that the monster wants Conor to face. Our main character doesn’t have an easy life. And I really like how author Patrick Ness doesn’t make Conor the typical flawed protagonists who has a naturally good heart. As I said before, Conor is flawed. And that’s what makes me relate more to him than other characters I’ve read, who are going through the same things he is in this book. And that’s what makes the book’s end all the more heartbreaking. Because by the time the book ends, we become Conor. A Monster Calls tells the story of Conor, but more than that, it tells the story of us. Humans doing human things, feeling human emotions–being human. And being monsters. This is definitely one of the best books I’ve read in 2012, and I’m very grateful for the friends who recommended this to me. Now, I shall be doing other friends favors by recommending this book to them. The last book I’ve read that had anything to do with pets was Katie: Up and Down the Hall. I remember writing something about the book not being so much about Katie than it was about the author and the family he made with his neighbors. And, I have to admit, that made me think twice about starting Cleo. Thing is, I already bought Cleo before I started reading Katie. And it never came to second-guessing my purchase, only wondering when I would eventually get around to reading it. Well, the Holy Week vacation (we have such a thing here in the Philippines) gave me the time I was looking for, and I have to say I really didn’t have much to fear with Cleo. The thing with books about pets is that it’s almost never really about the pets. I mean, I found Marley & Me good, and Katie not so good. Cleo, falls somewhere in between the two—but as I went on to finish the book, it moved towards the good end. 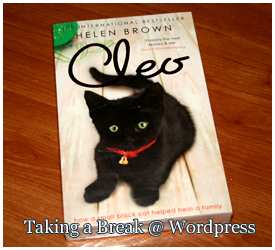 Cleo, the book, is much about Cleo the pet as it was about the author’s life. After all, the book’s selling point is how Cleo (the cat) helped heal the author and the people in her life. So it would make sense that many of the anecdotes actually have more to do with the author’s family than just Cleo. And unlike in Katie, where I thought the pet was a storyline moving alongside the author’s life, Cleo actually has a major playing part in her owner’s life. The book starts with death. One I didn’t expect. The author alluded to it in how she introduced the book, and how she talked about her sons—but, if this were a fictional story, the death was a twist, a blindside. I was surprised; horrified even, by what had happened. But as it is, death was just the beginning—and the beginning was jumpstarted by the appearance of Cleo in the author’s and her family’s lives. That was a very oddly-constructed sentence. Throughout the book, we follow the author as she goes through the rollercoaster of life: the loss of a child, raising two others, working to save a marriage, and eventually falling in love again. One can say Helen Brown, the author, has lived a life with enough heartache to spare half-a-dozen people from having to go through the same—but that’s life, isn’t it? It’s never fair. But through it all, the author had one constant companion who never bothered to feel sorry for her, but was always there to listen, to cheer her up, and to tell her to move on: and that was Cleo. On the book cover, it says that Cleo is the next Marley & Me; I think that’s doing the book a disservice. Cleo is a great book by itself, and it doesn’t need to be compared to any other books. And having finished the book, all I can say is that I wish to find a cat just like Cleo.